Our latest & greatest floor plan. A compact version of the home next door (view if to see fit & finishes of this one). Open 3 bedroom, 2 bath floor plan. Master suite is on opposite end of other bedrooms. Kitchen has island & patio doors to fenced & landscaped yard (coming this spring). 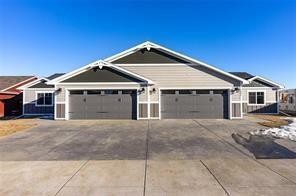 Extra large double attached garage with opener. No steps! No HOA but builder has contact that will do snow & lawn for $80 per month (subject to the amount of snow fall) & will provide that contact. Tricky to get to until Gleneagles goes thru. Take Clubhouse Way. View the model home next door to get an idea of the quality, design & features that will go in to this home. Will have lockbox 4/15/2019. Kitchen goes in this week.